This is a special Digest. In today’s issue, we’re going to cover one of the most powerful, money-making strategies available to investors. I don’t write that lightly. Some of the wealthiest, most successful professional money managers in the world have used this strategy to generate billions for themselves and their clients. I’m talking about real financial heavy-weights here — Paul Tudor Jones, Stanley Druckenmiller, George Soros, and David Tepper. These are the investment elite. And the strategy we’re discussing today is what they used to reach that status. It’s a special kind of market approach called global macro analysis. Now, rather than try to explain this myself, I’m going to do you one better. You see, our very own Eric Fry, editor of The Speculator, happens to be a world-class global macro investor. Eric’s track record proves this. Our CEO, Brian Hunt, sent an email on Wednesday that included some of Eric’s winners; for instance: 1,712% in Vostok Nafta, 2,888% on Royal Gardens Resort, and 4,114% on Antofagasta. Eric has written an essay that explains global macro analysis, detailing why it’s so powerful. Wall Street has sold investors on the idea they should start with “micro” analysis. That’s the idea that they should make investment decisions by comparing things like price/earnings ratios, income statements, or other company details. But I do the opposite. I start with the “macro” analysis. I look for big-picture trends that drive huge, multiyear moves in entire sectors of the market. When investors use the global macro strategy, they identify investment opportunities from a broad, global, top-down perspective, rather than by examining stocks one by one (a micro, bottom-up perspective). • The price trend of crude oil could prompt us to buy stock in an Australian transport company. • Weather patterns in the American Midwest could make me want to short a Russian fertilizer producer. • Changes in the Chinese economy could have us running out to pick up a Brazilian iron ore stock. It’s the “butterfly effect” in action — everything is connected. Compelling opportunities can emerge in any major financial market … and even some minor ones. Throughout history the greatest global macro traders have made billions of dollars by trading any asset … in any country … in any direction. And in 2000, Sir John Templeton bet on the dot-com bubble bursting and made $80 million. As overpriced tech stocks began plunging, Templeton made a fortune. I think there’s room for more names on that list. Maybe yours. And you won’t have to get there by day trading in and out of stocks. That’s not our strategy is here. With global macro analysis, you’ll soon find yourself pinpointing significant, long-term trends right as they’re taking off. I’m talking about the kinds of trends that can generate huge, multiyear moves in asset prices. That’s where you make the real money. Not by day trading. That’s how you lose your shirt — and frequently. I’m not exaggerating when I say that if you spot one of these big trends early, take a sizable position, and ride the wave, you can make life-changing returns. You only need to catch one big wave to make a large amount of money. Let me share a real-life example. In 2000, while most investors were wild for Silicon Valley’s tech stocks, an incredible development was unfolding on the other side of the world. China was entering the early stages of the biggest infrastructure build-out in history. The country began constructing highways, ports, bridges, factories, and power plants on a scale never before seen in history. Of course, all that activity required stunning quantities of natural resources. To fuel its building binge, China consumed massive amounts of copper, iron ore, oil, natural gas, coal, zinc, and tin. This construction boom in turn created one of the biggest, longest commodity bull markets in history. • Oil climbed from a low in the $20 per barrel range to $150 per barrel — a 650% gain. • Copper soared from $0.75 per pound to $4 pound — a gain of more than 400%. • Nickel flew off the charts by vaulting from $4,000 a ton to more than $50,000 a ton — a better than 1,150% gain. Because the stocks of commodity producers function as leveraged plays on commodities themselves, they staged even bigger moves. • The share price of oil producer Suncor Energy Inc. (SU) gained more than 1,300%. • Copper miner Freeport-McMoRan Inc. (FCX) soared more than 2,000%. • Norilsk Nickel Mining & Metallurgical Co. (NILSY) delivered an even bigger result by climbing more than 3,500%. 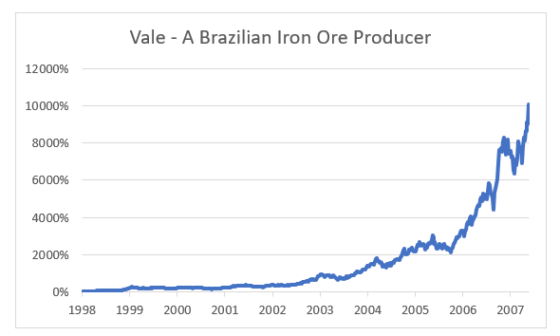 • And the stock of Brazilian iron ore producer Vale SA (VALE) topped them all by rocketing nearly 10,000%! While these resource stocks were busy producing their spectacular gains, a huge macro opportunity in gold was just getting underway. Back then, tech stocks were crashing and geopolitical tensions were heating up because of the 9/11 attacks. Global central banks responded to these dual traumas by printing more and more money. As a result, investors flocked to gold, both as a hedge against financial market volatility and against currency debasement. From its 2001 low around $250 an ounce, gold soared to nearly $2,000 an ounce by 2011 — a gain of more than 600%. • The stocks of top gold miners like Goldcorp Inc. (GG) and Buenaventura Mining Co. Inc. (BVN) advanced more than 1,500%. • Gold royalty company Royal Gold Inc. (RGLD) soared more than 4,000%. 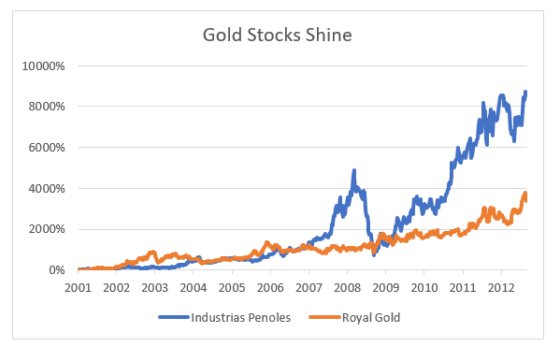 • And shares of big Mexican silver and gold miner Industrias Peñoles SAB de CV (IPOAF) rocketed nearly 10,000%! Intelligent speculators were making these Macro Millions at the same time U.S. stocks were losing ground. Remember the U.S. stock market’s “lost decade”? From March 1999 through March 2009, the S&P 500 produced a total return, including dividends, of minus 36.4%! Even world-beating companies like Berkshire Hathaway Inc. (BRK.A, B)produced a negative return during this decade-long drought. The gaping divergence between Freeport McMoRan’s huge upswing and the S&P 500’s simultaneous downswing highlights the power of global macro investing. The world is your oyster. Sometimes that oyster is an overseas market; sometimes it’s right under our noses in the U.S. market. For example, when the U.S. stock market’s lost decade ended in March 2009, it launched into the longest bull market on record. The S&P 500 Index produced a total return of more than 400% over the next nine years — far outpacing the gains of most foreign stock markets over this timespan. But an incisive global macro strategy could have produced much larger gains by targeting specific sectors of the U.S. market. Whether you like it or not, there’s no denying the introduction of Obamacare created tremendous new demand for healthcare services. So it’s no surprise that healthcare stocks were huge beneficiaries. 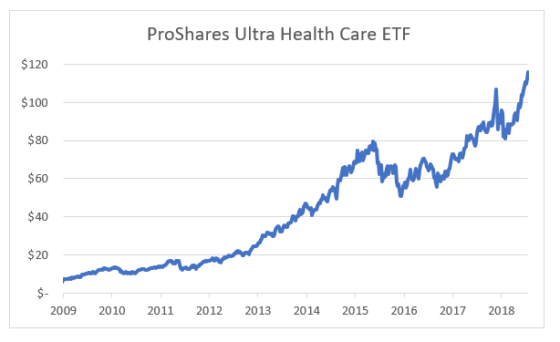 For example, look at the gains generated by ProShares Ultra Health Care (RXL), a popular leveraged healthcare ETF. This fund aims to return double the amount of a health care stock index. In the wake of the 2008 financial crisis, this fund traded for around $6 per share. It rode the Obamacare Wave to reach $60 per share in less than five years. But it didn’t stop there. At one point in 2018, RXL was trading for around for $118 a share! Identifying their potential was the direct result of conducting “top down” global macro analysis. In fact, many top global macro traders earned billions of dollars from these very trades. To be clear, I’m not saying global macro analysis will pinpoint the exact bottom or the exact top of every big move. Instead, I’m highlighting what’s possible when a big financial wave hits a specific financial market or industry sector. The world’s financial markets share fundamental connections to one another. As they interact with one another, they produce a continuous stream of opportunities. A disciplined and informed global macro analysis has the power to identify these opportunities. And it will do so just as they are on the verge of producing Macro Millions for intelligent speculators. *** Editor’s Note: I hope you’ve enjoyed this special essay from Eric Fry, editor of The Speculator. If you’re interested in learning more about Eric and his global macro approach, he’s put together a special presentation that’s available for a limited time. To watch, just click here. Article printed from InvestorPlace Media, https://investorplace.com/2019/03/one-of-the-most-valuable-digests-youll-ever-read/.